The COPS A team at Thetford. The City of Peterborough Swimming Club (COPS) A team cruised into the Junior Fenland League cup final after winning the last qualifying round at Thetford. The final points tally was COPS A 181pts, Wisbech 162pts, Thetford 133pts, Deepings 101pts and Mildenhall 92pts. COPS, the reigning Fenland Junior League champions, won 15 individual events and the cannon relay and gained 20 second places. Their winners were: Lauren Browne (13) 50m backstroke; Isabelle Cameron (9) 50m free and 50m backstroke; Laura Fehrenbach (11) 13/u 100m individual medley; Erivan Hamid (11) 13/under 50m backstroke; Ruby Hunnybun (11) 50m free; Safford Hewitt-White (10) 11/u 50m free; Mia Kharagholi (9) 25m fly; Eliza Mardon 50m backstroke and 50m fly; Joshua Martin (10) 11/u 50mfly and 12/u 50m breaststroke; Amy Paget (10) 12/u 50m fly; Stan Scarborough (10) 50m free and Joshua Spencer (11) 50m backstroke. 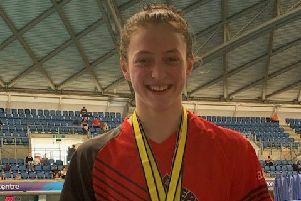 Also swimming for COPS A were: Lilly Borgognoni (12), Calleigh Coull (9), Alex Harlow (9), Isobel Illett (11), Emily Macfarlane (10), Bert Papworth (11), Oskar Rajski (12), Louis Roberts (9) and Josh Smith (11). COPS B missed out on qualifying for the cup final despite finishing second in their gala at the Regional Pool. The final result was Boston 159pts, COPS B 154pts, Chatteris 131pts, March 123pts and First Strokes 102pts. The COPS winners were: Thomas Bromley (13) 50m free; Briony Burmby (12) 50m fly; Eleanor Byrne (11) 50m breaststroke; Mark Goodes (12) 100m individual medley; Cameron Fisher (13) 50m breaststroke; Sophie Galjaard (13) 50m free; Keiran Griffin (10) 11/under 50m breaststroke; Carys Horn (9) 50m breaststroke; Jamie Peacock (10) 50m fly and Jack Underwood (9) 50m breastroke and 10/under 50m backstroke. Also swimming for COPS B were Ruby Blakeley (9), Hannah Daley (12), Leah Dorman (9), Lewis Flower (13), Isla Fulluck (9), Kirsten Loutit (12), Kate McLoughlin (13), Matthew McLoughlin (9), Ella Normington (10) and Ismail Tajer (10).